We noticed a signal in a recording of transmissions from EQUiSat that had a very odd Doppler shift. It turned out that there was a second satellite above the horizon at the same time and it was transmitting on a similar frequency. SiriusSat-1 uses 435.57 MHz and EQUiSat uses 435.55 MHz. If the first satellite is Doppler shifted by -10 kHz and the second is +10 kHz the signals will overlap. To understand the potential for interference I examined the orbits of the two. Both satellites were deployed from the International Space Station (ISS) during the summer. EQUiSat in mid July then SiriusSat-1 and SiriusSat-2 in mid August. Because of the similar deployment the two satellites are in nearly identical orbits. The inclination of the two orbital planes is within a few ten thousandths of a degree. The orbital inclination of the two satellites. The eccentricity and other orbital elements are also close. The main difference between the two orbits is the period. Both circle the Earth in about 92 1/2 minutes. But the orbit of EQUiSat is 2.8 seconds shorter per orbit. The orbital period of the two satellites. At the beginning of September the two were 1/2 an orbit apart on opposite sides of the globe. Moving slightly faster EQUiSat has been slowly gaining on SiriusSat-1. The distance between the two satellites has been steadily decreasing as EQUiSat “catches up” with the other satellite. The next graph shows the distance closing between them. At distances greater the 4,600 km (~2,800 miles) the curvature of the Earth prevents them from having line of sight radio contact. There is no chance of radio interference at those distances. The distance between the two satellites during late Oct. and early Nov. 2018. Let’s take a closer look at that sharp vertex on November 5th. There are several close approaches within a few dozens of kilometers. The two closest are about 5 km (~3 miles) apart. It is very rare for satellites to pass this close to each other. A series of close approaches on Nov. 5, 2018. There’s a very interesting pattern in the above plot. The two satellites are zig zagging back and forth as the distance changes. This is due to the slight differences between the orbits. There are two nodes where the orbits converge. On November 5th one is above the North Atlantic and the other is south of Australia. The closest approaches occur at these points. The position of the two spacecraft for orbits on Nov. 5, 2018. This crossover can be seen in the orbits plotted below. 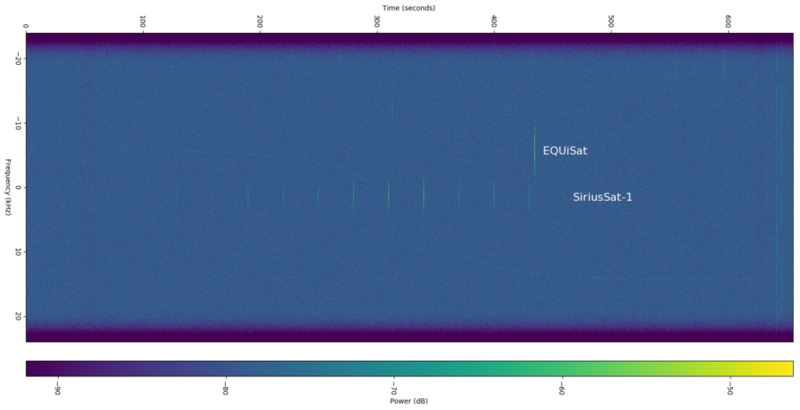 The SiriusSat-1 orbit is purple and EQUiSat is white. The purple trace starts very slightly south of EQUiSat near the Ladd Observatory ground station at Brown University. The paths cross over the ocean and then the purple track is slightly to the north of EQUiSat by the time it reaches the ground station at Sapienza University of Rome. There is a closeup animation of this at http://thuban.physics.brown.edu/equisat/close_approach.wmv showing a view from 100 km above. The probability of a collision is very small but non zero. This is not the first close approach EQUiSat has experienced. On October 24 SiriusSat-2 came within 7.905 km (4.912 miles) and then 5.162 km (3.208 miles) of EQUiSat during one orbit. This satellite operates at 435.67 MHz which is far enough from EQUiSat that we didn’t notice the signal. The proximity of SiriusSat-1 using a nearby frequency has a chance of causing interference during November. But due to the 30 to 40 second interval between transmitting packets there is only a small chance of overlap. Another concern is that NORAD may have difficulty distinguishing the radar signature of the two satellites when they are close causing slight errors in the published orbital elements. Update: Two days before the close approach with SiriusSat-1 on November 5th the minimum distance was estimated to be 5 km. On the day of the approach the estimate was 3 km. Recalculating on November 8th using the most recent orbital elements gives a result of 2.571 km (1.598 miles) as the miss distance.